Post-Election World Offers Challenges and Opportunities for American Business – Linda talks about the demand for products and services and the future use of analytic tools. “Special Event Recap: Be Heard – How to use Strategic Marketing to Stand Out Above the Noise with Linda Popky” on FEW Japan. “Marketing Experts Dissect the Outcome of the Presidential Race” on ama.org – Linda offers her marketing insights. “Best Small Business Marketing Blogs 2016: Top Experts to Follow” – CreditDonkey(tm) rates Linda’s Leverage2Market blog as one of the best for small business marketing. Hiring and Retaining Talent Critical to Ongoing Success – Linda talks about the needs to evaluate not only new hires but existing staff against the same metrics. Summertime No Vacation For Business Momentum – Linda talks about summer as a great time to plant the seeds for fall and winter marketing success. Act Local Marketing 150: Marketing Above the Noise podcast with Linda Popky and Kalynn Amadio. 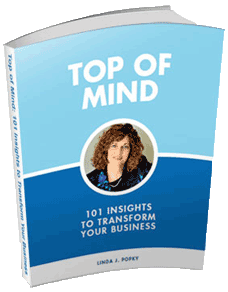 Marketing Above the Noise was nominated as the Small Business Book Award in Marketing. Smart Businesses Learn How to Thrive in An Era of Volatility – Linda talks about how a volatile market brings opportunity. Excerpt contributed by Linda Popky in CMO Council’s PeerSphere magazine, Vol 4, Issue 4, p. 38. Half a Century of the Big Game: What Businesses Can Learn from America’s Super Bowl Obsession – Linda comments on how advertisers have turned the Super Bowl into a major advertising event. 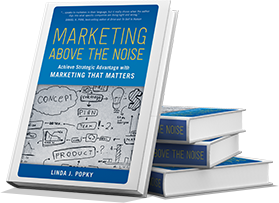 Marketing Above the Noise is a finalist in the Marketing Book of the Year 2016 competition. Vote between Jan 15 and Jan 31!